Perfect name! It shows you how it is that Reno, Nevada, is WEST of Los Angeles, California! Whoa, Menkib is one hot star. It is ionizing a region all along a 100-light-year-long cloud? If the ultraviolet light that emanates from Menkib is included, its total bolometric luminosity is 263,000 times that of the Sun. If it had any planets, the radiation experienced on them would be quite hard to imagine. With an estimated age of just ~7 Myr no evolved animals were harmed in the making of Menkib. Neufer, on a day I needed a smile, a big thanks! Crazy what changing one law can do for a state. A “glowing” orange is the new blue it seems - depending on the wave you’re catching. Will it be a thrill or a wipeout? To receive the same amount of energy as we do, an orbiting planet would have to be 15 times Pluto's from the Sun away. Thanks for your post comparing the Menkib-Pleiades region with the United States, Art. Even I though it was funny (including the orange color of California in the map of the United States). A nice thing about Rogelio Bernal Andreo's picture of the Perseus-Taurus region is that it makes it easy to see that Menkib is a runaway star. It was born in the star forming region which can be seen as a bluish-pinkish-brownish splotch at upper center left in the picture, almost midway between the California Nedbula and the Pleiades. Menkib even seems to be leaving a trail of stars behind it as it speeds through space, piling up gas before it like a snowplow and making it glow red. 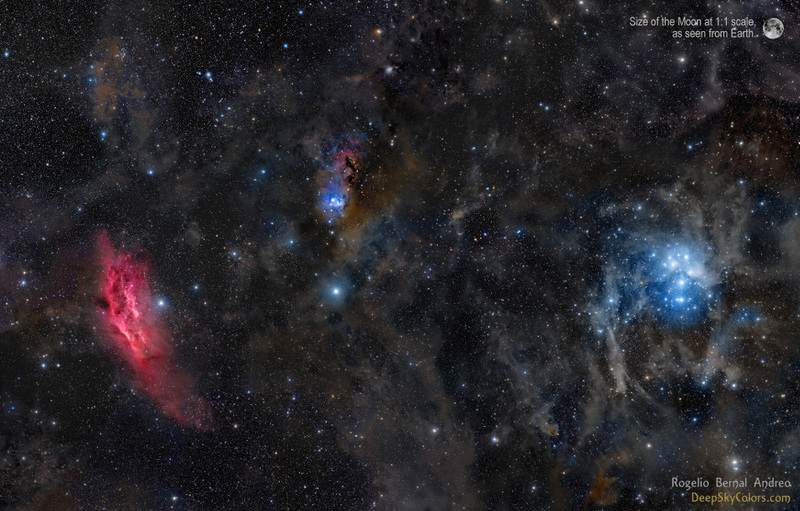 So Orange in the APOD and Red in @neufer's post from Rogelio Andreo's image.